Project Perfect Mod :: View topic - Any chance for a long-smooth option? Any chance for a long-smooth option? Posted: Fri May 06, 2016 5:05 am Post subject: Any chance for a long-smooth option? VXLSE's auto-normals do pretty well when there are small features, or face transitions of 1-2 pixels, but not when the transition is over 3+ pixels. 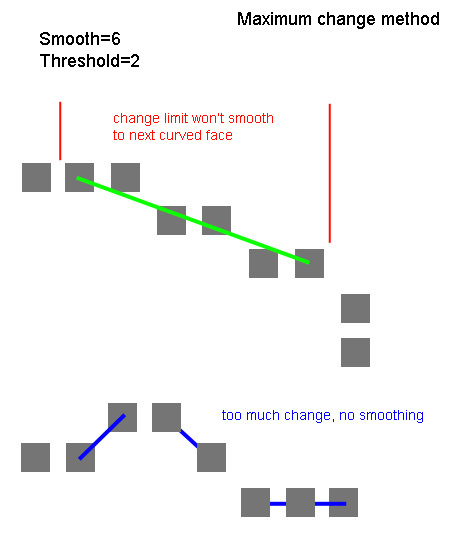 Since computation power is relatively free, can we add another auto-normals option based on whichever makes most sense, but biases gradual transitions across 5-7 or so pixels on a layer (perhaps allow us to choose threshold and target smoothness). Then repeat that process once for each axis. If we could even choose which of the 3 axes to smooth this way, we could specify the slices to be from the TOP for a large vessel, since we would have no need to smooth from the SIDE, and we could choose a more aggressive smoother from FRONT. I think this could go a long way to bridging the quality gap to converted 3d models. I think it makes the most sense to do the calculations as individual layers, smoothing the direction of normals to prevent jaggies in arcs. You need the knowledge of context to do it in a proper way. This is part of my PhD thesis and I'll still take a long time to finish it. 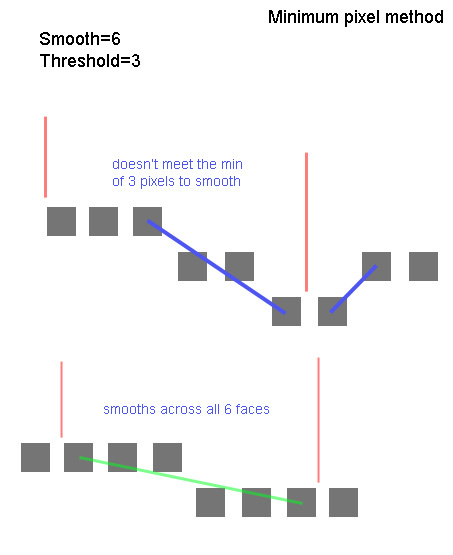 Well this is why I suggest the threshold setting for the user to play with, and using it on a single layer. Then the context is whatever the user decides works best.